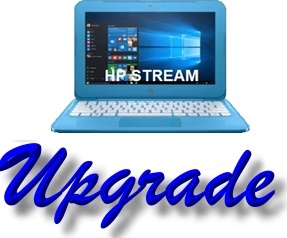 ﻿ HP Stream Laptop 32gb, 64gb and 128gb Storage Upgrade, HP Stream Laptop Drive Upgrade, HP Stream SD Card Upgrade. The HP Stream typically comes with 32gb of on-board storage. In most cases, this will not be sufficient and will cause issues such as slow running and failure to perform Windows updates etc. The solution is to send the laptop to us. We will effectively double the HP Stream storage by fitting and configuring a compatible, high speed 32gb SD Card. This will be setup as a second HP Stream drive. We will copy specific system folders to the new HP Stream drive and configure Windows to use the new HP Stream drive for storing photos, Documents etc. We will then perform all available Windows updates. 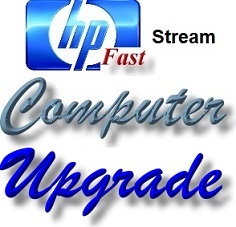 We also offer 64gb HP Stream upgrades to give total HP Stream Storage of 96gb. We also offer 128gb HP Stream upgrades to give total HP Stream Storage of 160gb. Please note; Additional external HP Stream storage can be added with a USB hub (to read additional SD Cards, USB flash drives etc) or with an external USB Drive. 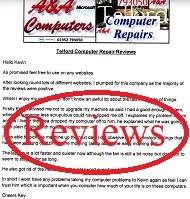 Welcome to HP Stream Laptop Upgrade from A&A Computer Repair; not only serving Shropshire and Dudley, but providing HP Stream Laptop Repair and HP Stream Laptop Storage Upgrades throughout the Midlands and the UK.